The Treasurer was right to point out the good news of very respectable employment growth in Queensland in recent months (see chart above). Many of the new jobs were likely in the building industry and hospitality, particularly as the lower dollar boosts tourism and as households are starting to shake off the frugality induced by the financial crisis. 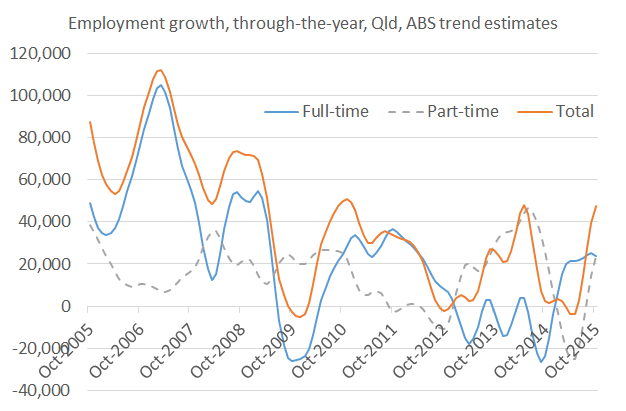 Trend jobs growth in QLD has been running at a pace greater than the expansion of the working population. The labour market has seen some credible improvements in recent months and a continuation at this pace should see the unemployment rate steadily drifting lower. In other words, jobs growth is good, but not great, particularly from a historical perspective. The unemployment rate will only steadily drift lower, rather than experiencing large rapid falls. And there is, of course, the possibility that recent gains could be reversed, if some of the risks to the economy that have been highlighted in recent months (e.g. declining business investment and a China crash) are realised. So, it is not yet time to get excited about the economy. This entry was posted in Labour market and tagged abs, china, construction, employment, hospitality, jobs, jobsgrowth, labourforce, labourmarket, qld, queensland, unemployment, unemploymentrate. Bookmark the permalink.